kulcha recipe on tawa | amritsari kulcha recipe | aloo kulcha recipe with detailed photo and video recipe. a typical punjabi cuisine indian flat bread recipe prepared with all purpose flour / maida with potato stuffing. amritsari naan or kulcha is typically baked in indian tandoor oven but this recipe is uses tawa on stove top. 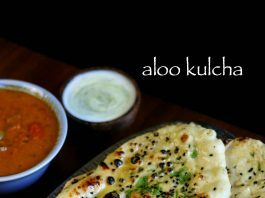 kulcha recipe on tawa | amritsari kulcha recipe | aloo kulcha recipe with step by step photo and video. a popular naan bread recipe from indian and pakistan cuisine which is typically consumed with chole masala or channa masala. amritsari kulcha is a potato stuffed kulcha recipe which is popular bread recipe from amritsar, a city in punjab. i always prepare kulcha recipe for my lunch or dinner with any paneer based curries or with soya chunks curry. however, i was surprised to learn that in punjab these naan bread recipes are eaten for breakfast. especially aloo kulcha recipe with plain raita or mint raita is the most popular in sub continent. i also like it with simple mango pickle or even with dal makhani. 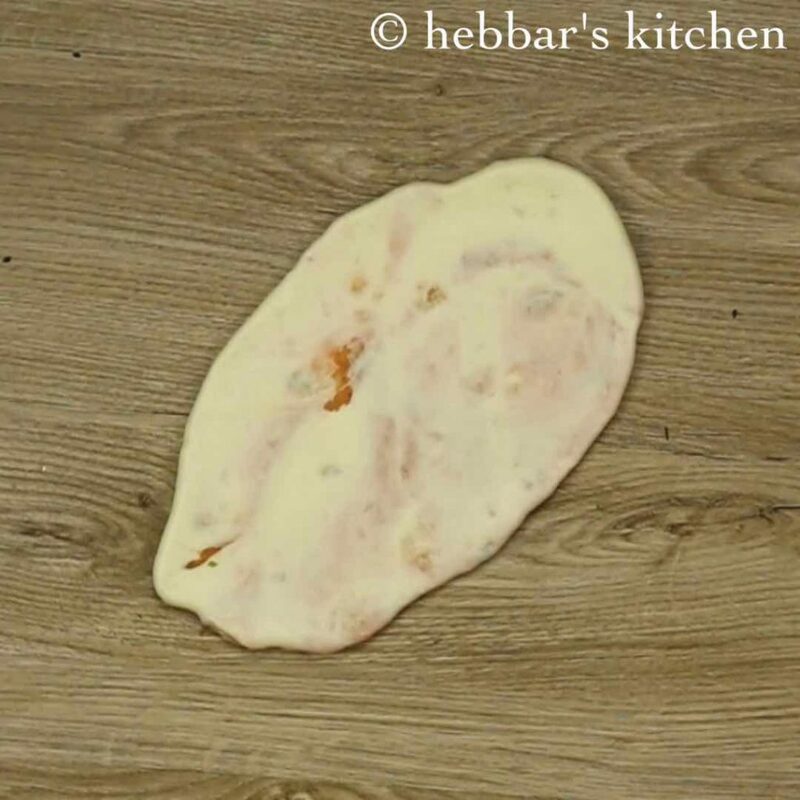 furthermore, some important tips and suggestions for a perfect amritsari kulcha recipe. 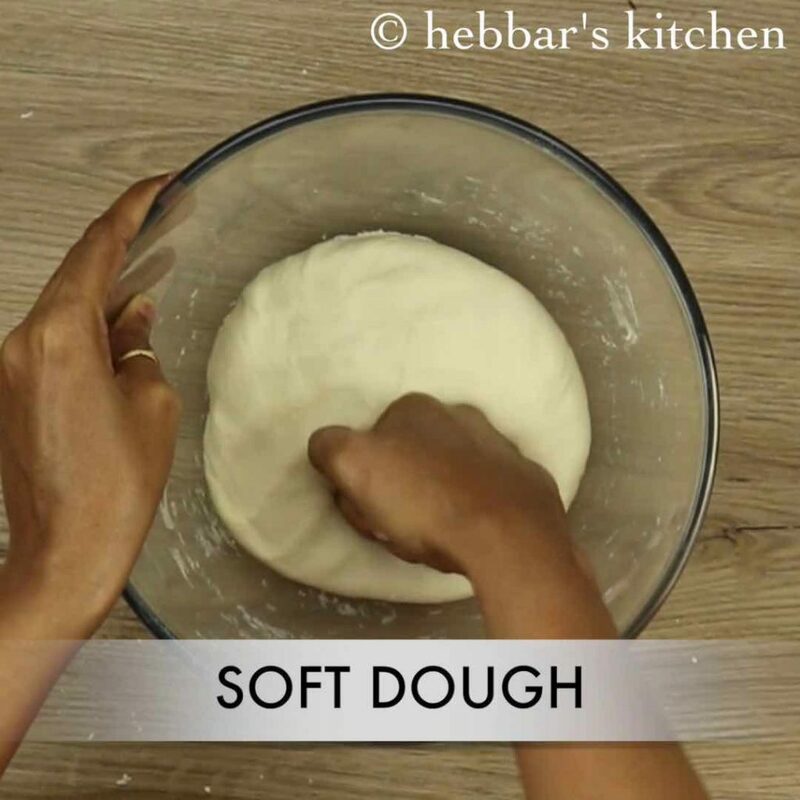 firstly, i have kneaded the dough with plain luke warm water, however even warm milk can be used to knead the dough. 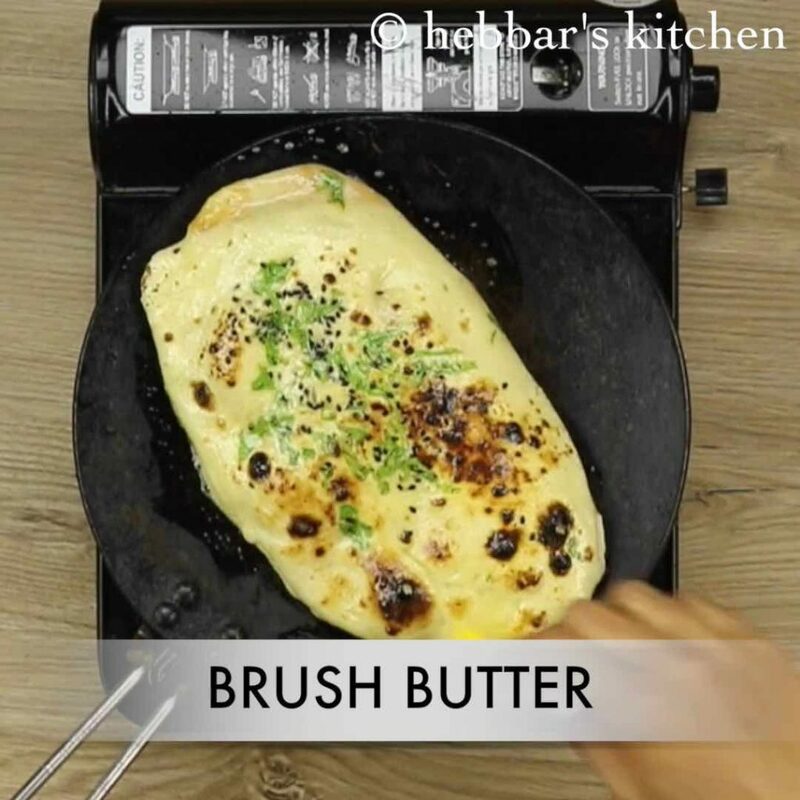 this would result in a soft and layered kulcha recipe. secondly, always apply water to backside of kulcha before heating it on tawa or oven. 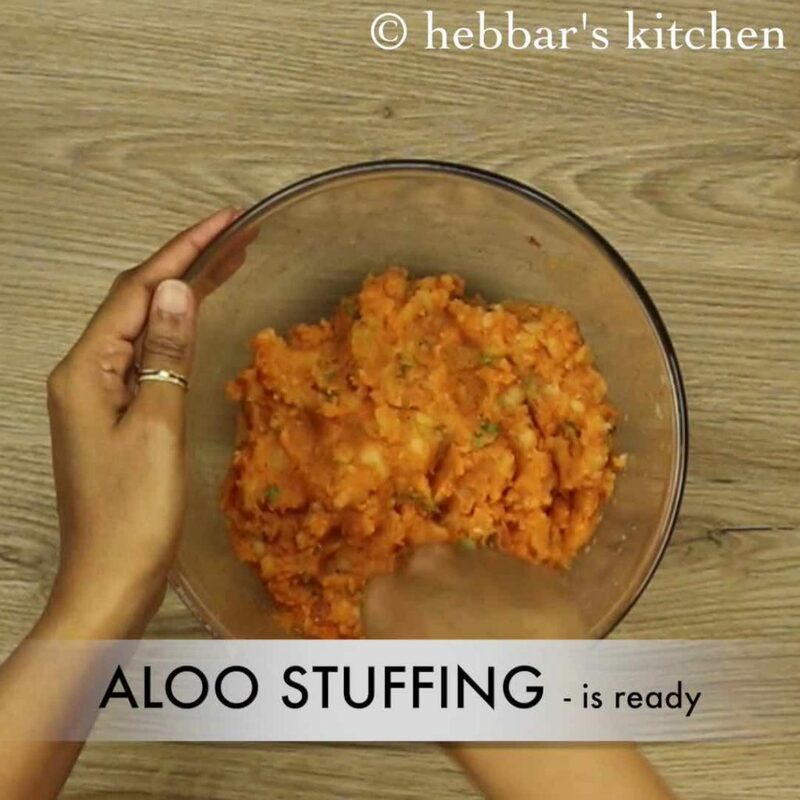 lastly, the potato stuffing can be completely ignored and you can prepare plain kulcha recipe. meanwhile, in a mixing bowl prepare stuffing mixing the ingredients listed for stuffing. 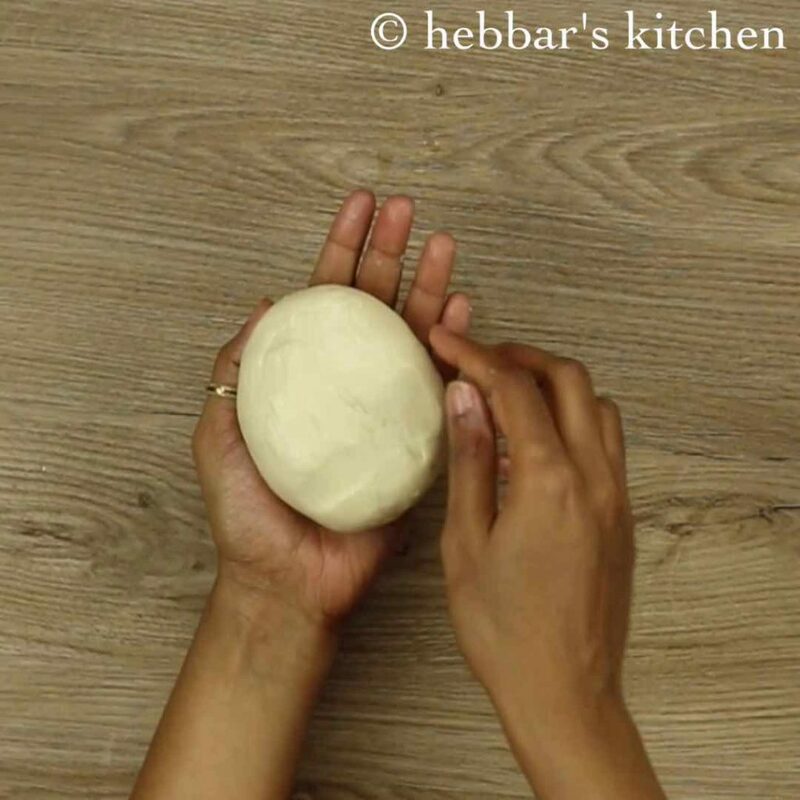 after 2 hours, pinch a ball sized dough. 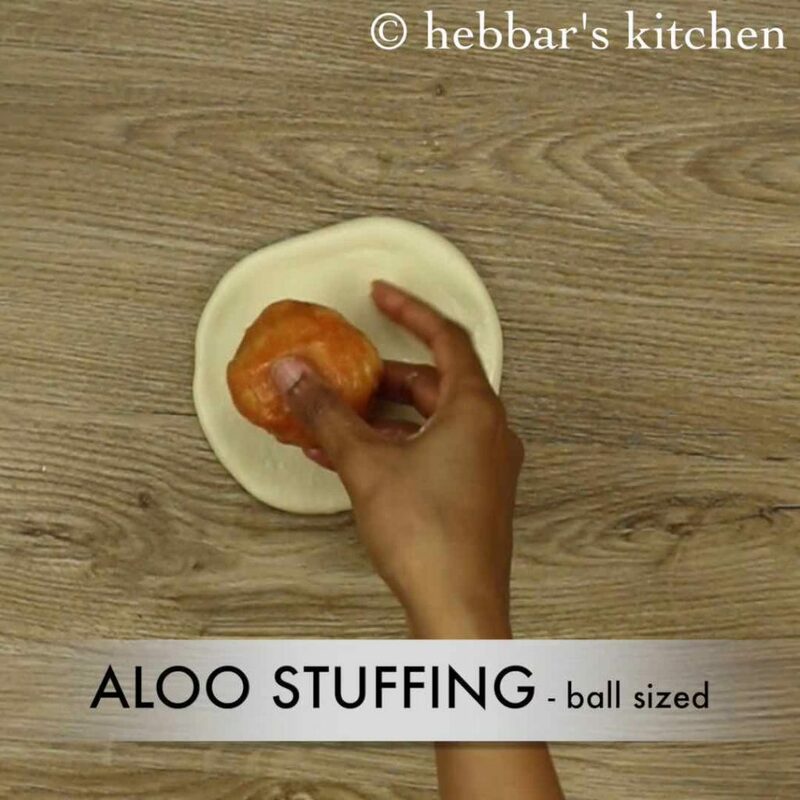 and roll to 5 inch circular disk and place aloo stuffing in the centre. sprinkle some sesame seeds and coriander leaves. 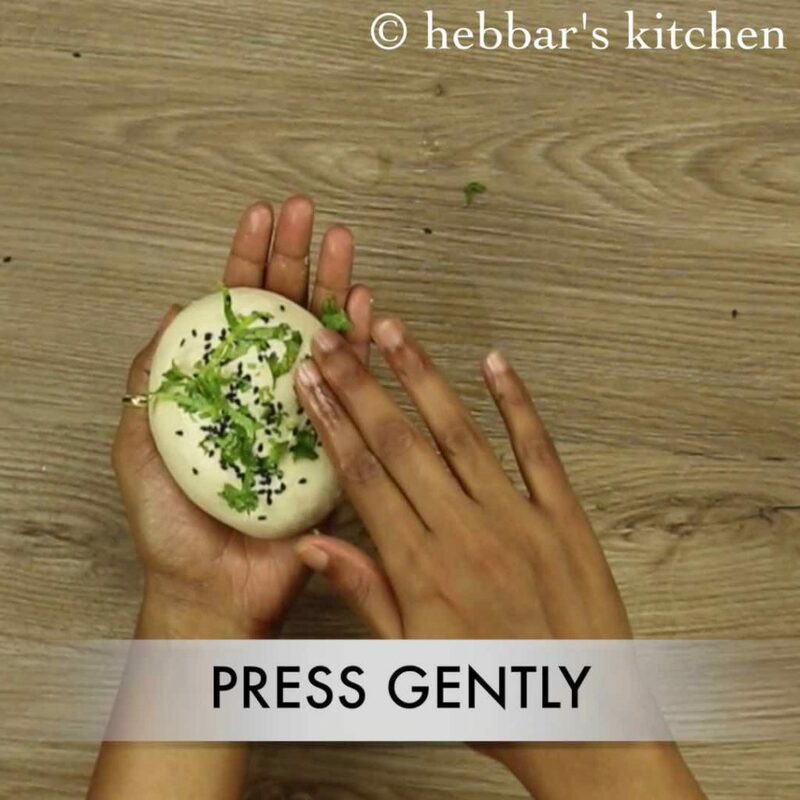 gently roll to oval shape using rolling pin. furthermore, slowly flip over and put it on hot tawa and press gently. finally, spread some more butter and serve aloo kulcha hot. 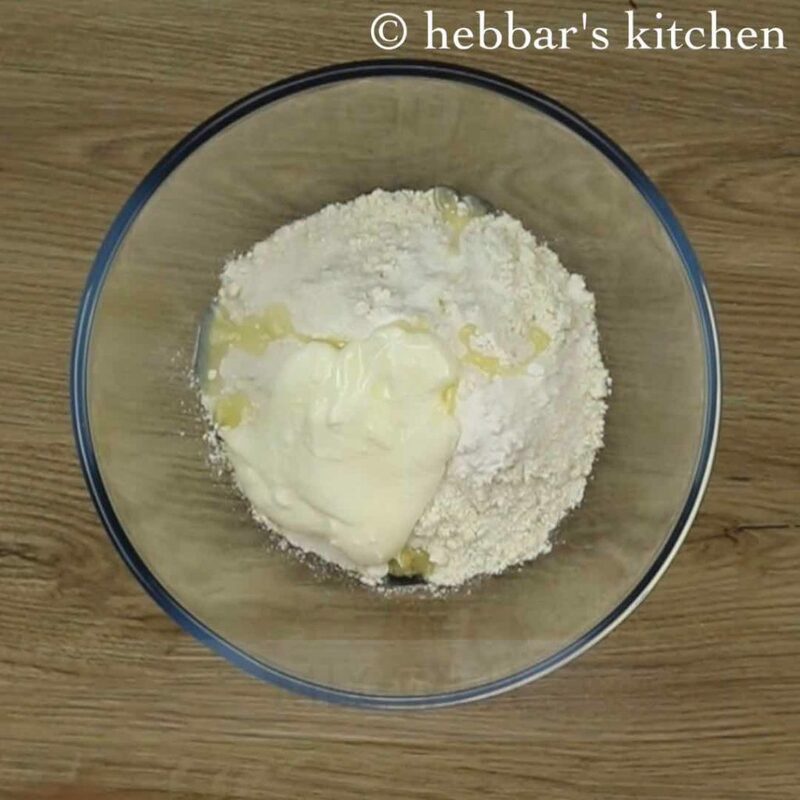 firstly, in a large mixing bowl add maida, sugar, baking powder, baking soda, salt, curd and oil. 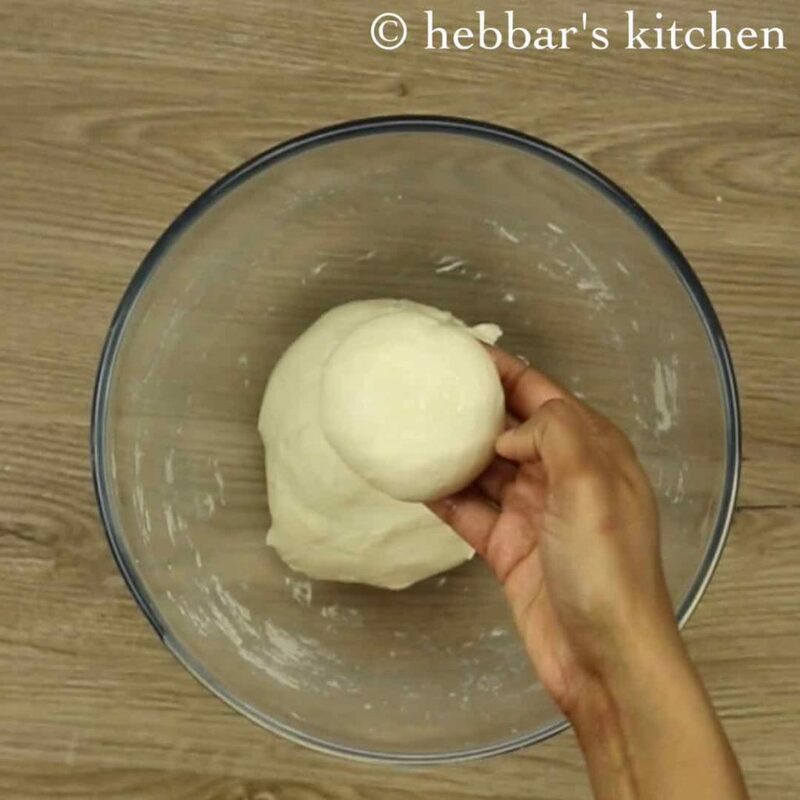 further add luke warm water and knead the dough for 10 minutes. 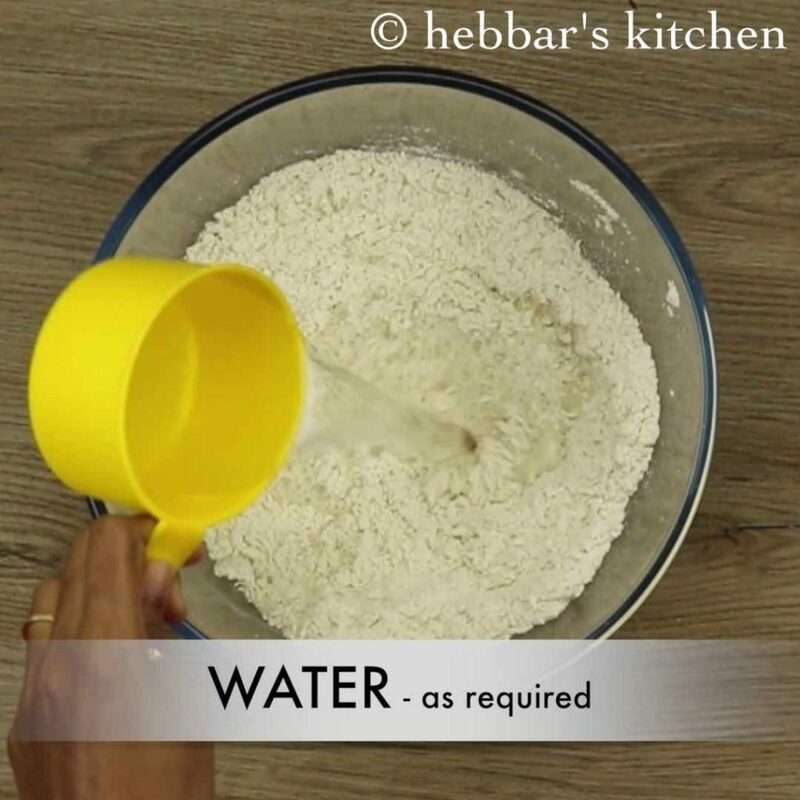 add more water if required and knead to smooth and soft dough. 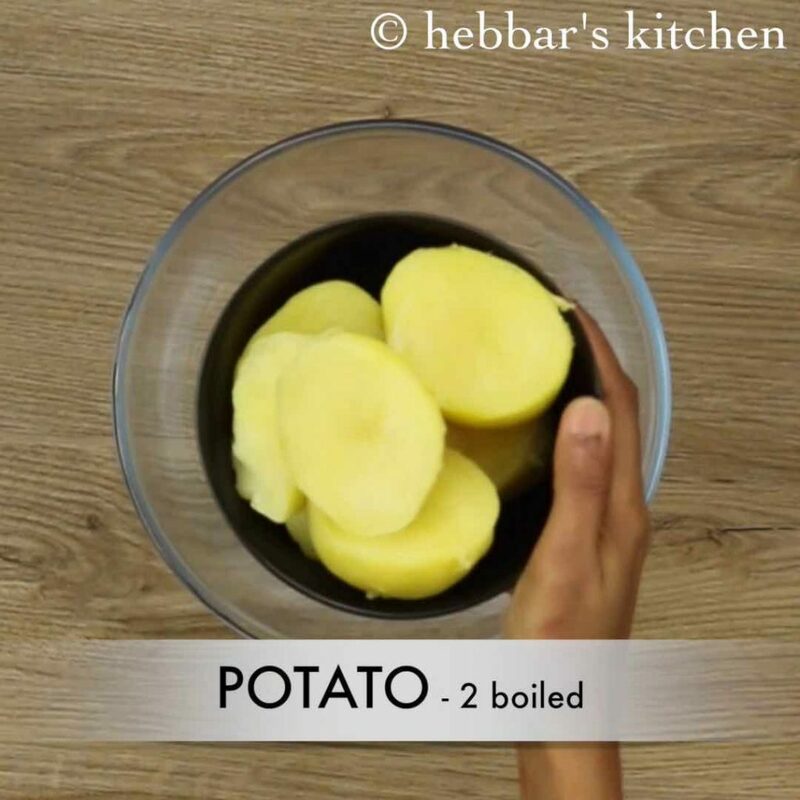 firstly, in a mixing bowl take boiled and peeled potato. 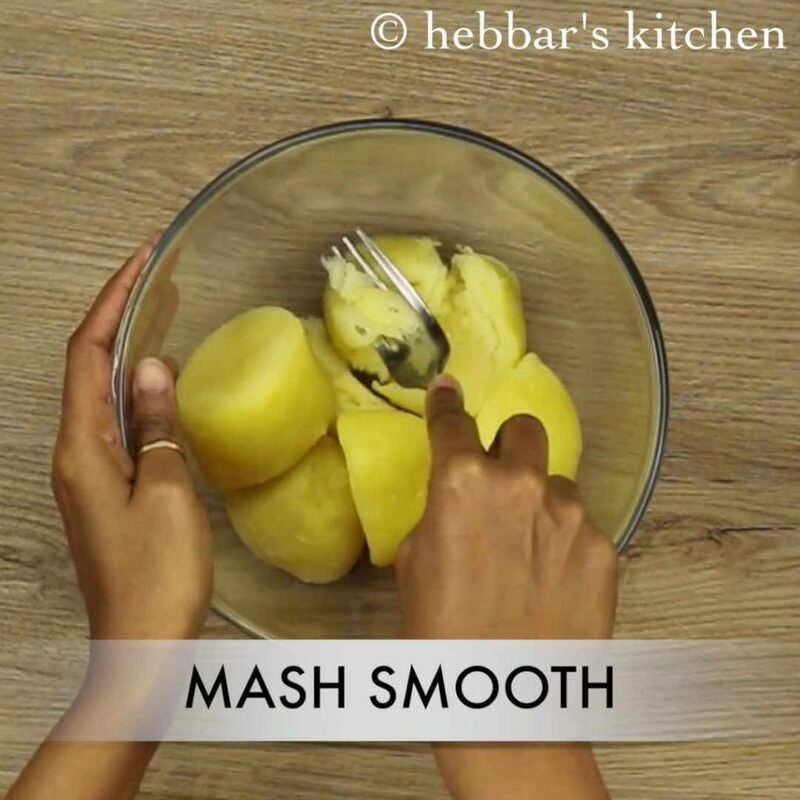 further mash the potatoes well. 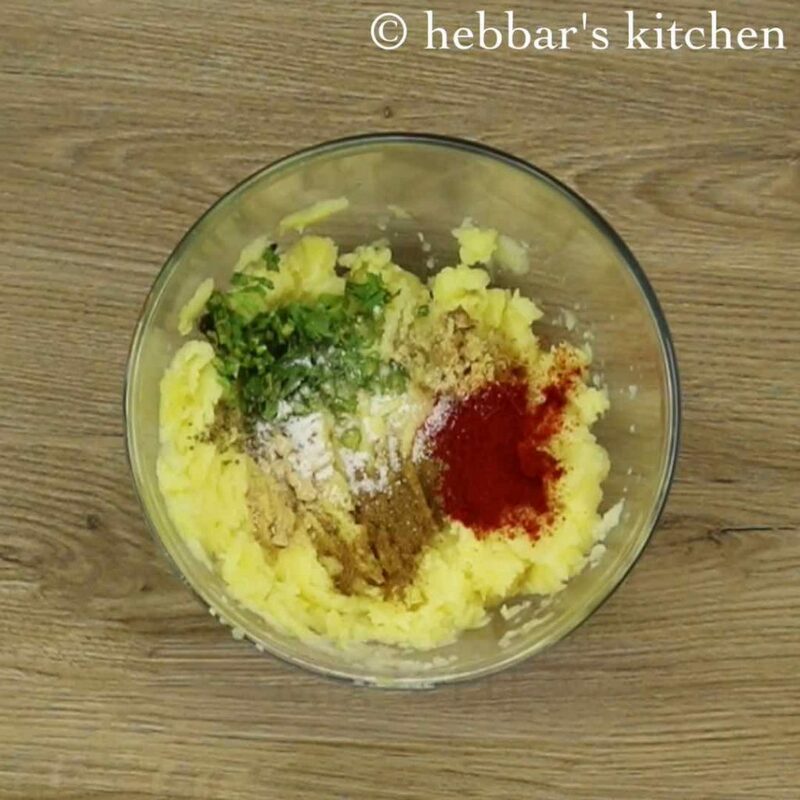 also add green chili, ginger, red chili powder, garam masala, aamchur powder, coriander leaves, ajwain and salt. mix well making sure everything is combined well. keep aside. 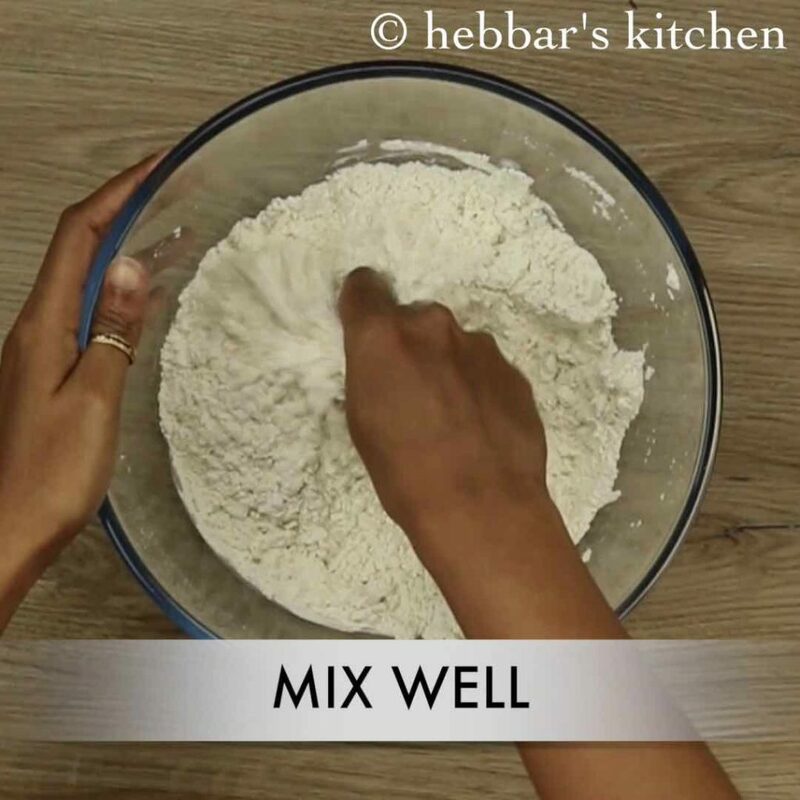 after 2 hours, knead the dough slightly. to remove if any air present in the dough. pinch a ball sized dough. and roll to 5 inch circular disk. 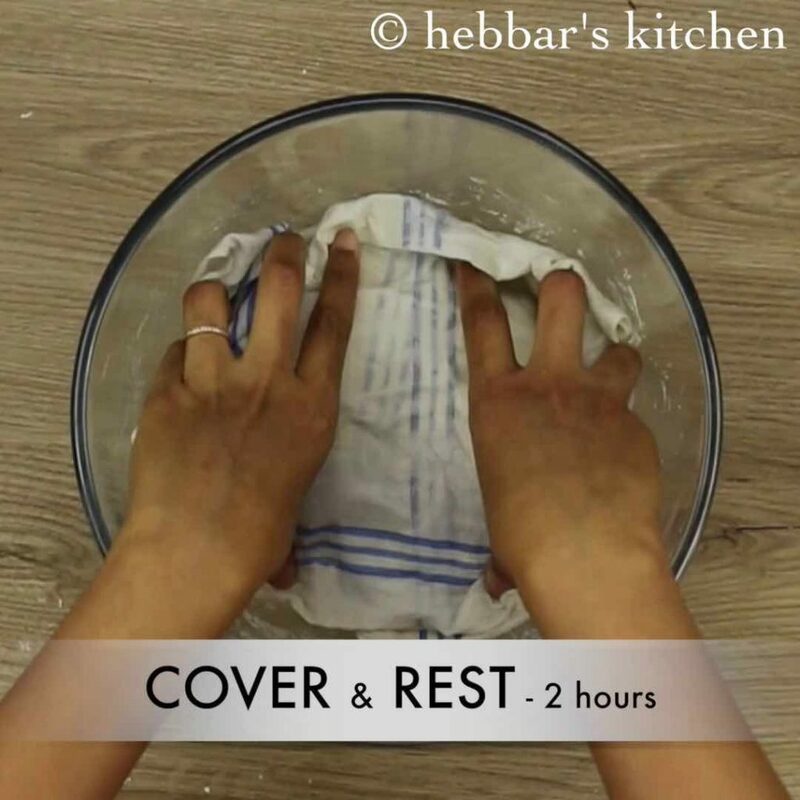 apply oil if the dough is sticking to the rolling pin. further place a ball sized aloo stuffing in the centre. also join the pleats together and secure tight. reverse the ball to avoid any pleats from forming. 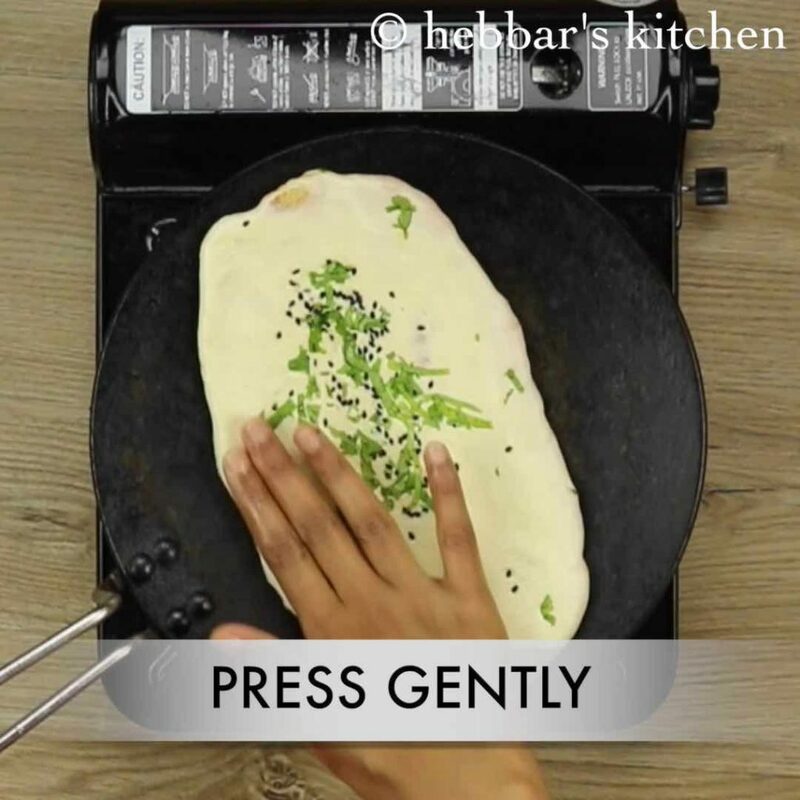 further slightly press and flatten with your hand. 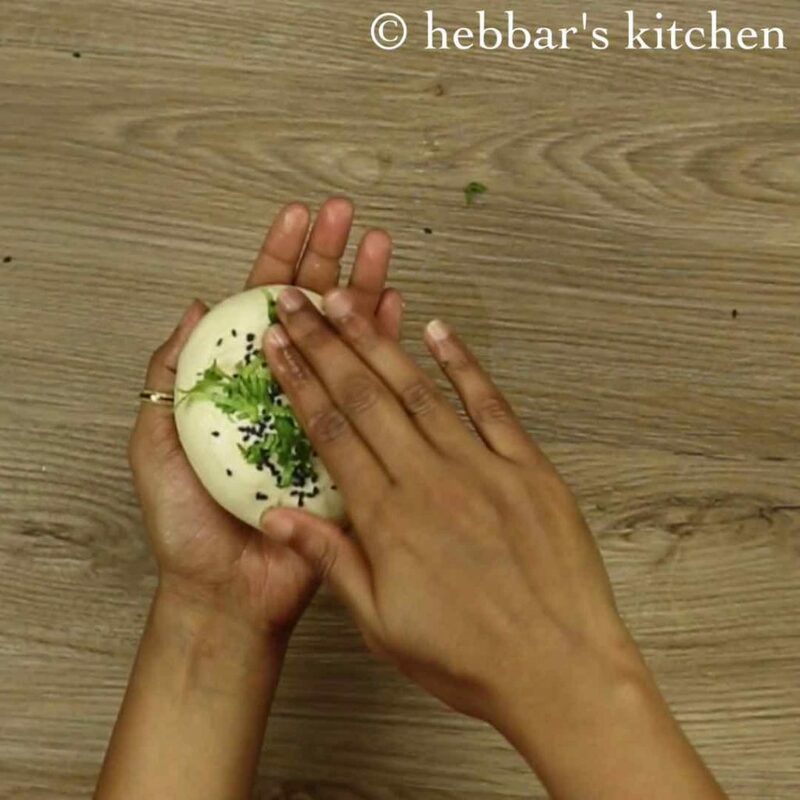 reverse it upside down, making sure the coriander leaves and sesame seeds faces down. 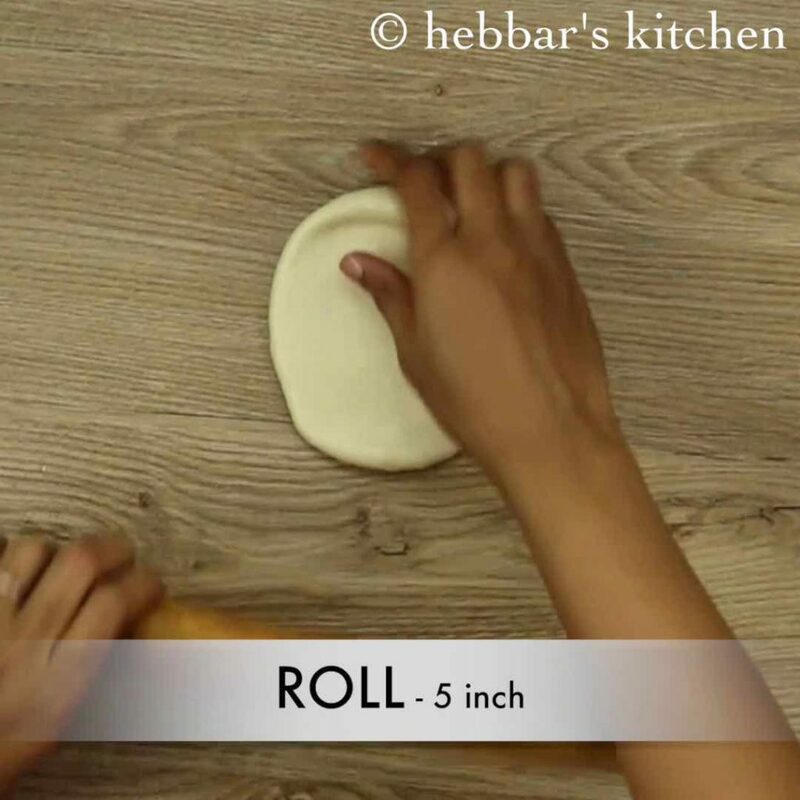 gently roll to oval shape using rolling pin. make sure you do not make too thin nor thick. and also keep the size in mind. it should not be larger than your tawa size. 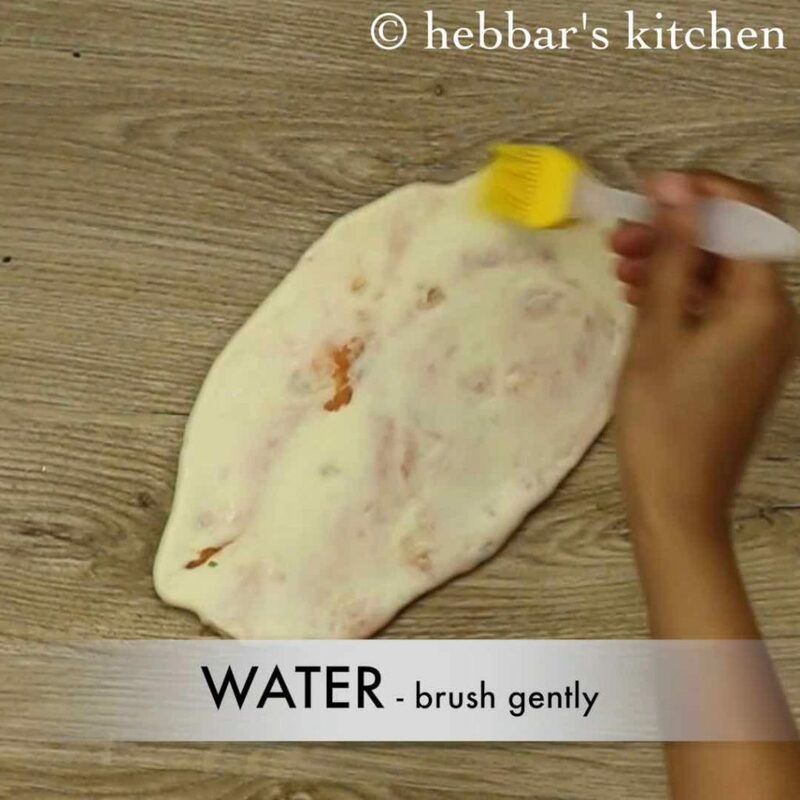 brush with water over kulcha. make sure you coat uniformly. this helps kulcha to stick on tawa. furthermore, slowly flip over and put it on hot tawa. 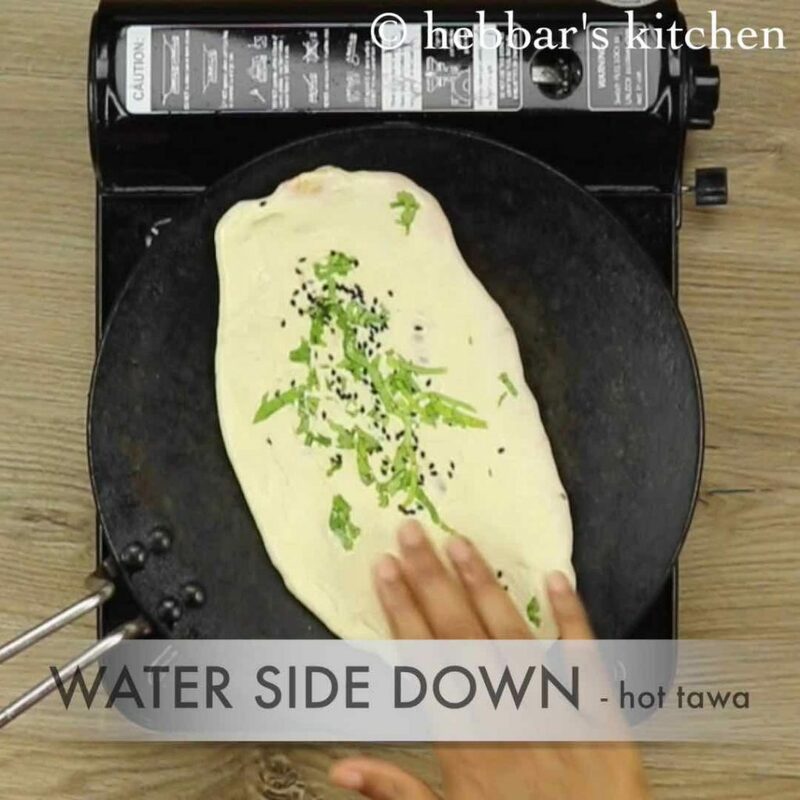 remember, be gentle and put the water coated side down to tawa. also do not use nonstick tawa. slightly press. this helps the kulcha to stick on to the tawa and when you can flip the tawa upside down it will be intact. 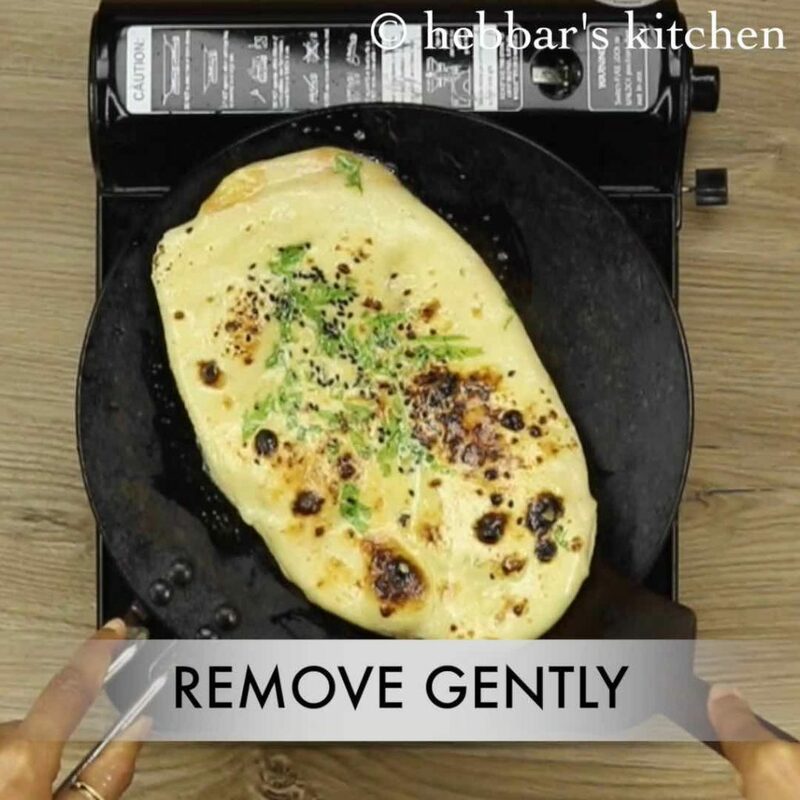 gently remove scrape the kulcha from bottom and remove. 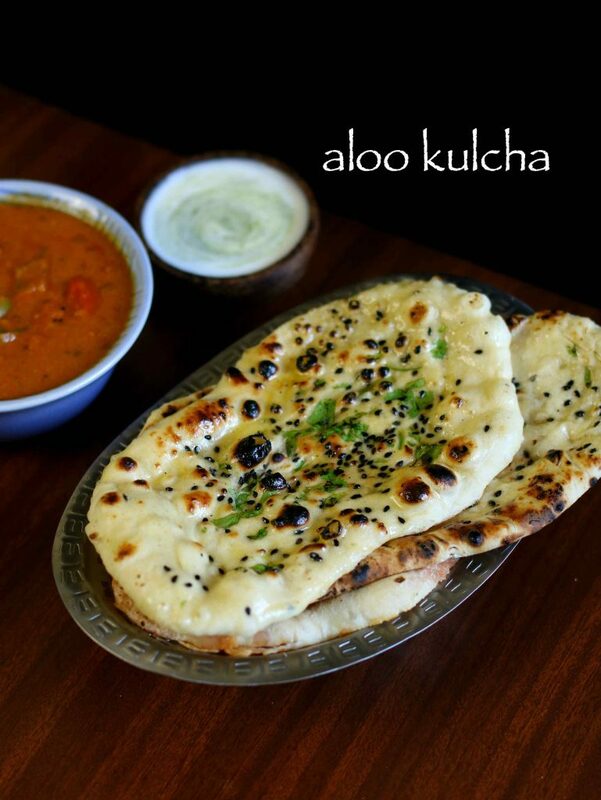 finally, serve aloo kulcha hot with your favourite curry like chole masala or channa masala. 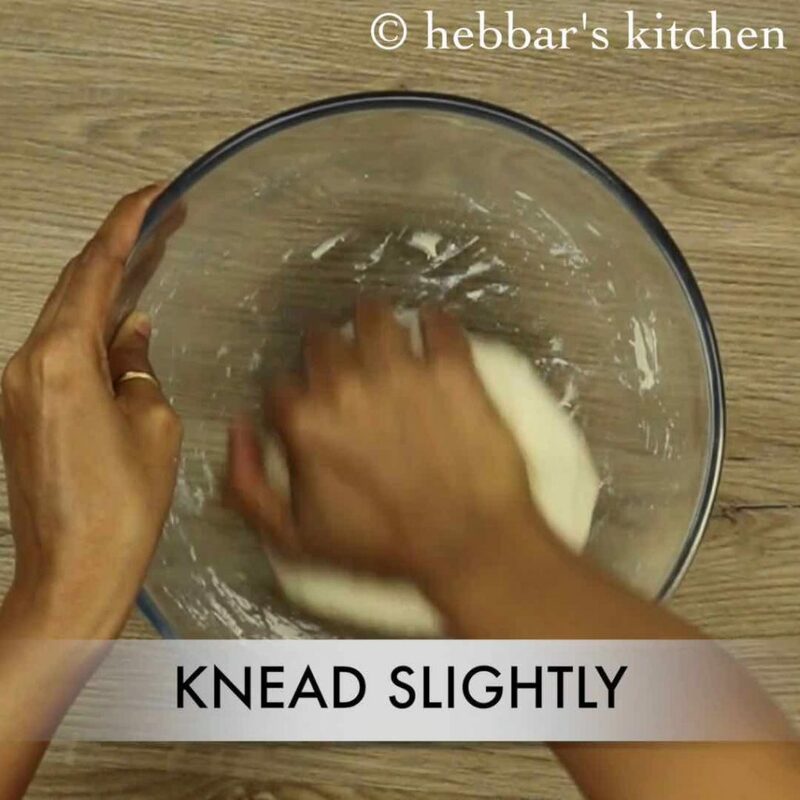 firstly, knead to smooth a soft dough else kulcha will be chewy. also to prepare plain kulcha just skip the stuffing part. applying water is mandatory. 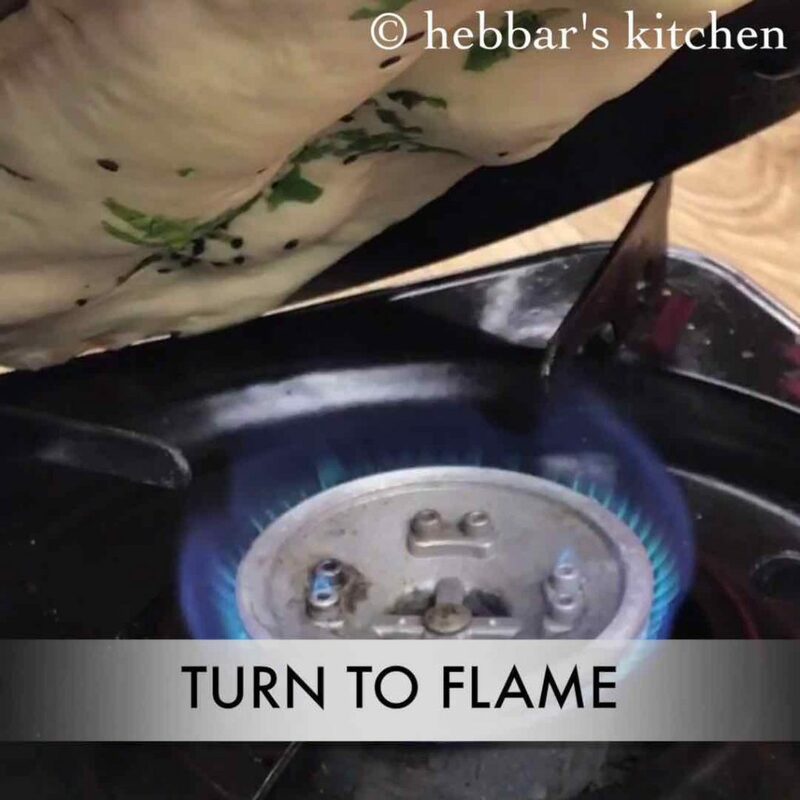 this helps naan or kulcha to stick to tawa and can reverse the tawa and cook directly on flame. in addition, you can also use oven or tandoor to bake the kulcha instead of tawa. but never use nonstick tawa as it slips while reversing. furthermore, roll to any desired shape. however, i like to keep it oval as it looks similar to the one served in restaurants. 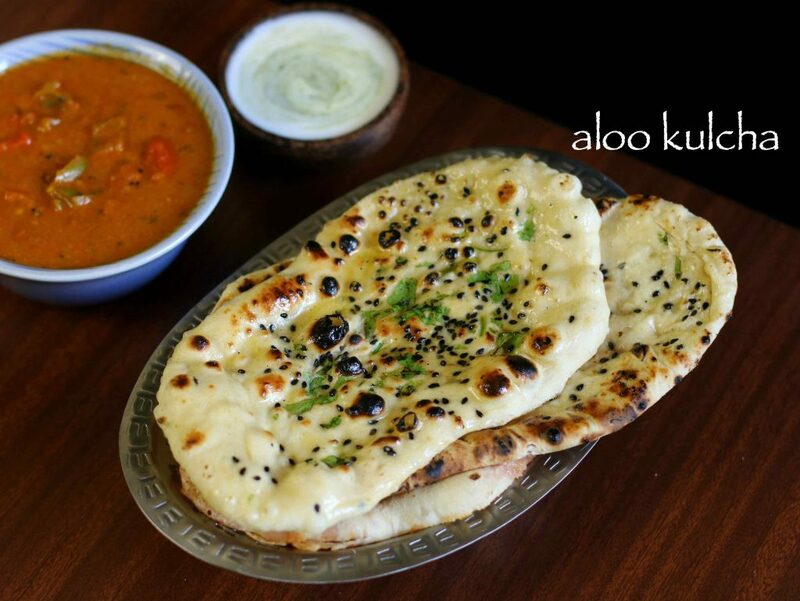 finally, amritsari kucha or aloo kulcha taste great when served hot. Hi, I don have an option here in Europe to use fire in the Process as u have mentioned. Is there a possibility to do the same with a bake oven?? Kindly suggest. yeah you can place in oven till it cooks completely. Hi, it was awesome recipe. It became my hubby’s favourite. Thanks a lot for such delicious recipe. It was awesome. My hubby liked it a lot. Thanks for such delicious recipe. I tried making, but my dough got too sticky. Is there something l can do with that or shall l knead the new one. Really super tasty recipe,but tell me onething,which is your stove. hi do I have to heat at the same temperature without stuffing the kulcha? yes it would be same. Hi the kulcha looks yummy. How do we do it in an oven ?